We ended up with beautiful weather on Sunday morning- breezy with a temperature in the mid-60's. Matthew and I arrived at the race start around 7 am to pick up our packets. The race started at 8 am and the course would be open for four hours. But if you didn't think you could finish the course within that time frame, you could start at 7:15 am which I thought was really cool and was a great way to incorporate people of all fitness levels. Both parking and packet pick up held on City Island and both were super easy. Our packets contained our bibs, race shirts, and the usual race swag stuff- samples of protein bars, advertisements for future races, etc. There were plenty of bathrooms to use at the start (always a plus!) and there was even water available for runners and walkers. 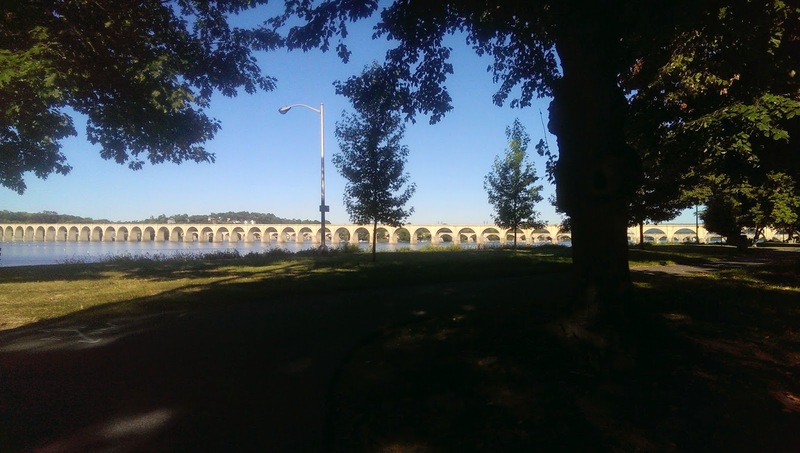 The view of the Walnut Street Bridge and Harrisburg from our parking space. After we walked our packets back to the car, Matthew and I had about a half hour to kill before the race. We found a spot near the start and just sat down and tried to relax and come up with a game plan for each of our races. Since I had been having foot issues, my plan was simple: finish. It was slightly disappointing that I couldn't try to push for a PR with this race especially because I had heard about how flat the course was. But, listening to your body is important and I absolutely did not want to aggravate any potential injury by pushing too hard. Before long, it was time to start the race. Without much fanfare, we were off! Matthew started a little earlier than me as he was hoping to finish somewhere around two hours. I started in the back of the pack and luckily the runners spread out pretty quickly- there were only around 1,000 participants. 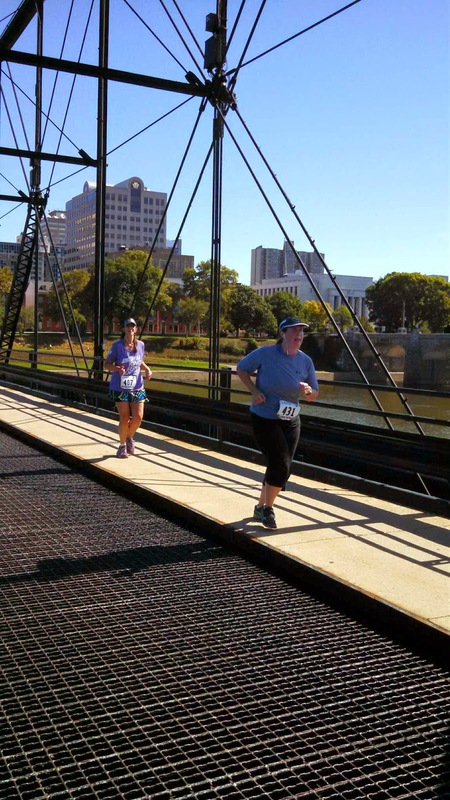 The course started with a quick little loop around some of the island and then across the Market Street Bridge to the main part of the city. 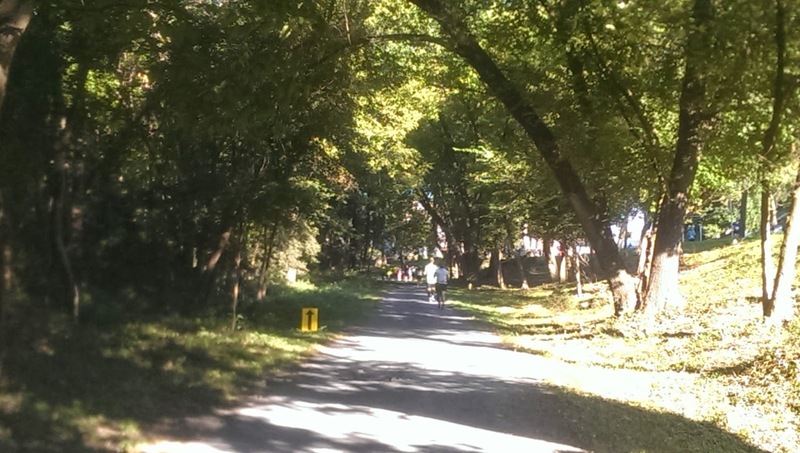 We ran through a very industrial part of the city and then into the "Greenbelt" which I'd never heard of- it was sort of like a trail with a gravel path and lots of shade. I felt fabulous all through this part of the race! We were running along the river to start and then once we entered the "Greenbelt," it was absolutely gorgeous. It truly was a beautiful run for miles 1-5. Crossing the Market Street Bridge. For real, I love crossing over bridges during races. Running back towards the bridge- so pretty. 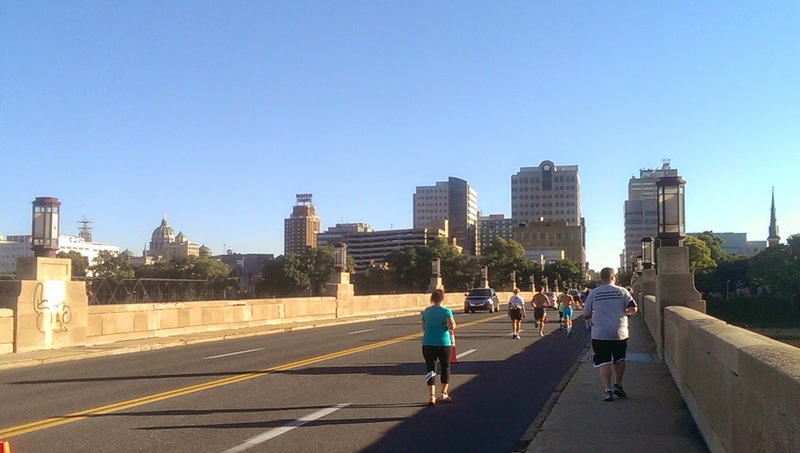 The next part of the course took us back towards the Market Street and Walnut Street Bridges. 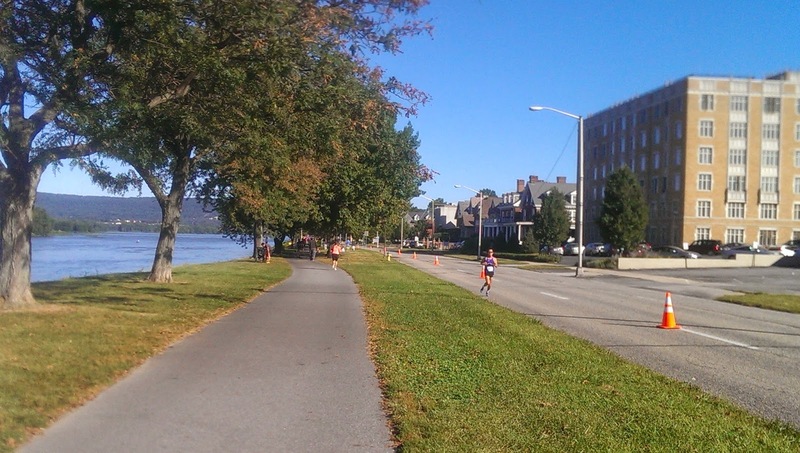 We passed them at about mile 5 and then began our out-and-back journey down along the river for a few miles and then back across the Walnut Street Bridge to the finish. 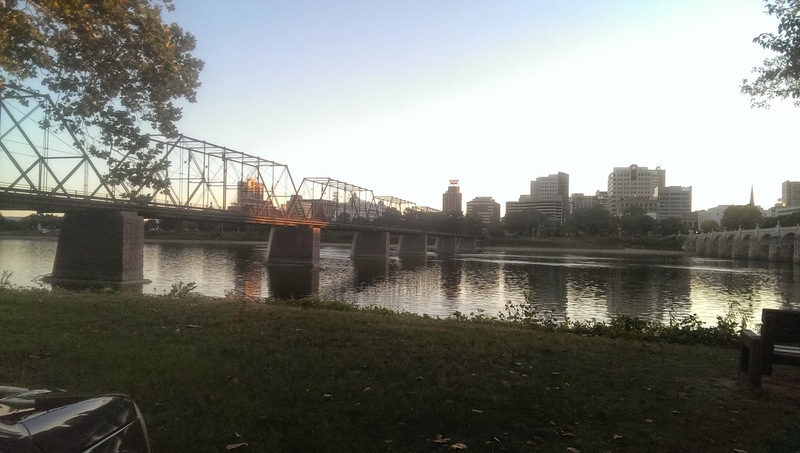 It was really cool to run this close to the river. 10 points for this spectator. One of the front runners heading back to the finish. So, while I love out-and-back courses, they can really mess with your head. Watching lots of runners go past you, knowing they are miles ahead of you, can be somewhat of a mental challenge. I felt great all the way up through the turn-around and up until mile 10. Then, out of nowhere, I hit a major mental wall. I knew I had at least 2.5 miles to get back closer to the bridge I'd cross to finish and it just seemed like it was so far away. I started to feel run down, hot, and nauseous. Luckily, I have a couple of tricks up my sleeve for just this type of melt-down. First, I texted Matthew. He had already finished (2:05:34) and was waiting for me on the bridge. Just a few "you can do this" texts from him and I started feeling better. Second, I focused on the things that were within my control- breathing and form. I focus on breathing in for two steps and then breathing out for two steps. I concentrate on filling my lungs with air and then imagining that air bringing much needed oxygen to my muscles. I straighten up my posture and focus on hitting a perfect mid-foot stride. Third, I thanked the Sports Bra Gods that I was wearing an Enell bra. 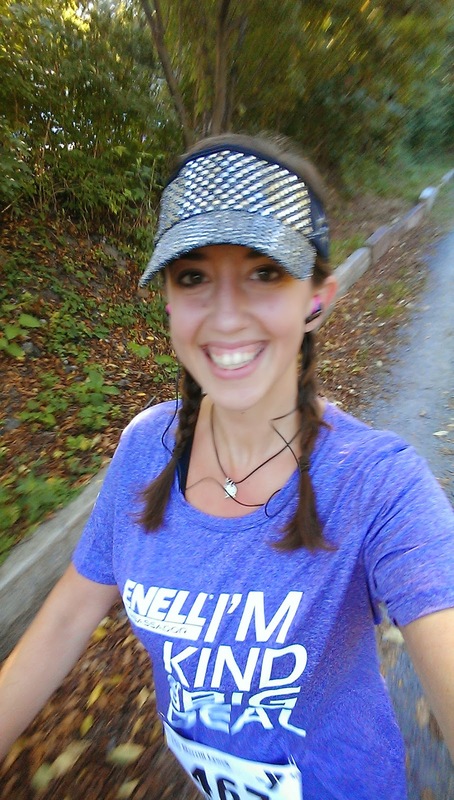 Wearing my Enell not only controls uncomfortable bounce, but it also helps me with correct running form. It actually helps me stand up straight. And by standing up straight, I can breathe better. And by breathing better, I can feel better while I'm running. Enell to the rescue! 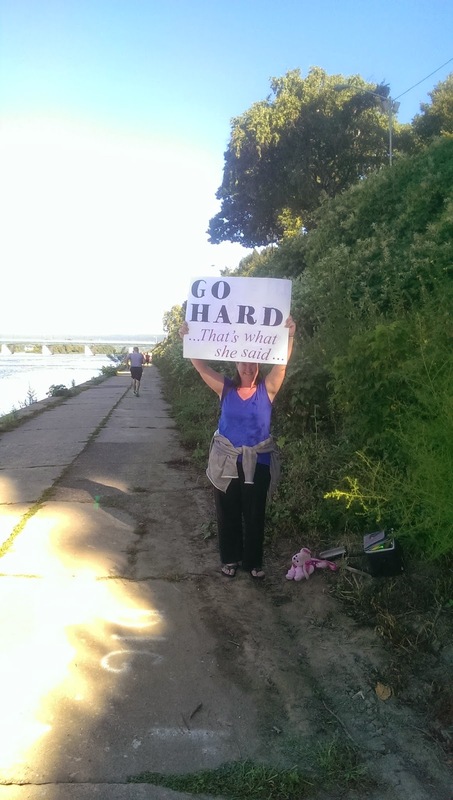 I somehow made it to mile 13 and was able to see Matthew as I was crossing the bridge. The finish was literally just past the end of the bridge on City Island. I mustered up the strength I had left and pushed across the bridge. I finished in 2:37:54 and I don't know that I've ever been happier to finish a race! The bridge I'd been waiting 13 miles to cross! After we got our medals, we headed down to the packet pick up area to get some water and food. 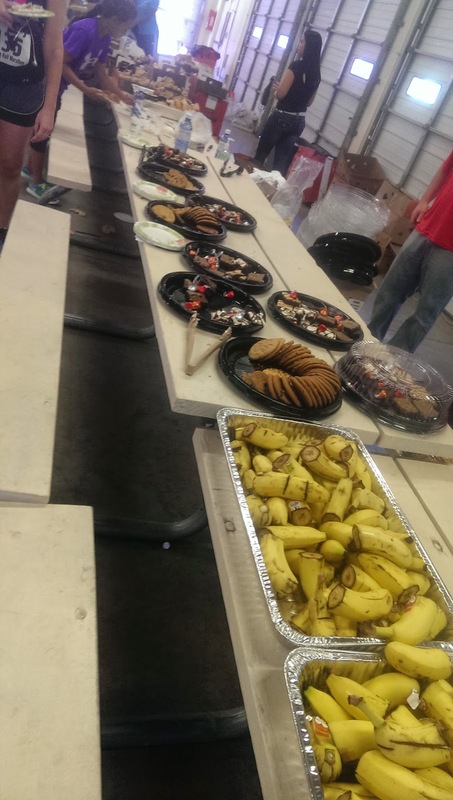 They had an incredible spread- Panera bagels, cookies, chips, and an assortment of fresh fruit. So delicious. We ate some fruit, got a few finisher's pictures, and then made our way back to the car. Those cookies were hard to resist. 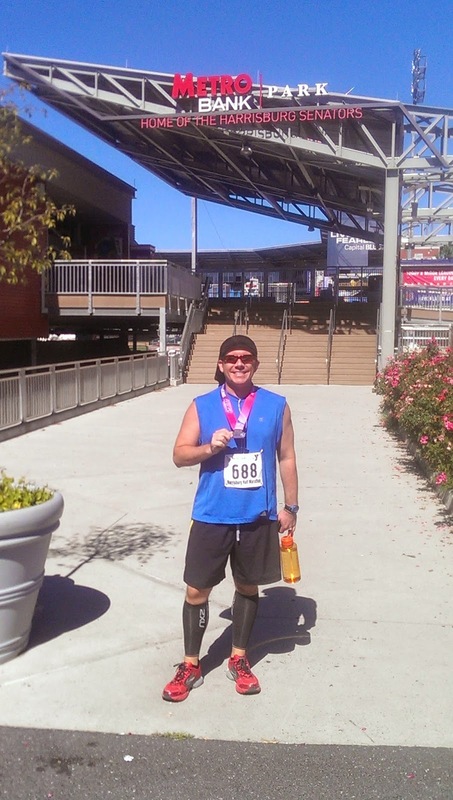 Another half marathon in the books. The benefits of this race were numerous- small field of runners, flat and scenic course, very organized, good amenities for runners. There were only a few complaints- mainly the medal and the shirt. Last year's design included the capital building; this year it was just a generic "13.1." But those were just minor preference differences. Overall, this was a great race that I'm sure we will run again in the future. 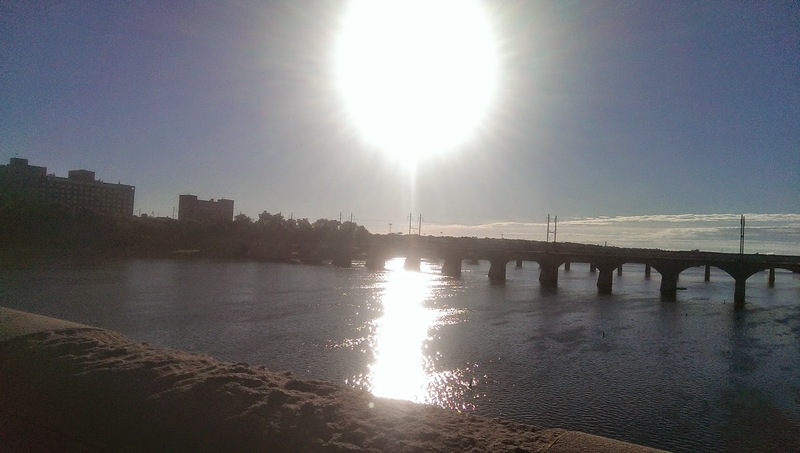 QOTD: Your thoughts on bridges and running- love them? Hate them? Don't really care? I'd love to hear what you have to say. I can't be the only one who loves running over them! Disclaimer: My registration fee for this race was paid for by Enell as part of their Ambassador Program. I received no other form of monetary compensation. As always, all opinions are my own. Nice job on your race Sarah and congrats to Matthew too! The photos show off a beautiful course and you clearly enjoyed yourself with all those smiling shots! You are a big deal! Thanks! It was a great race! I love the fact that you share your difficulties and challenges as well as your victories. As a new runner going for my first half marathon in November (Disney Wine and Dine), those specific tips for how you dealt with feeling overwhelmed and tired might help me if I experience similar feelings. I hope that your foot problem is a minor soft tissue injury and that it heals quickly. Thanks, Lisa! We all struggle sometimes- finding what works for you will be key to your future running success. Wine and Dine will be awesome- it's my favorite Disney race! I hope you don't hit a mental block and you have an absolute blast!!! 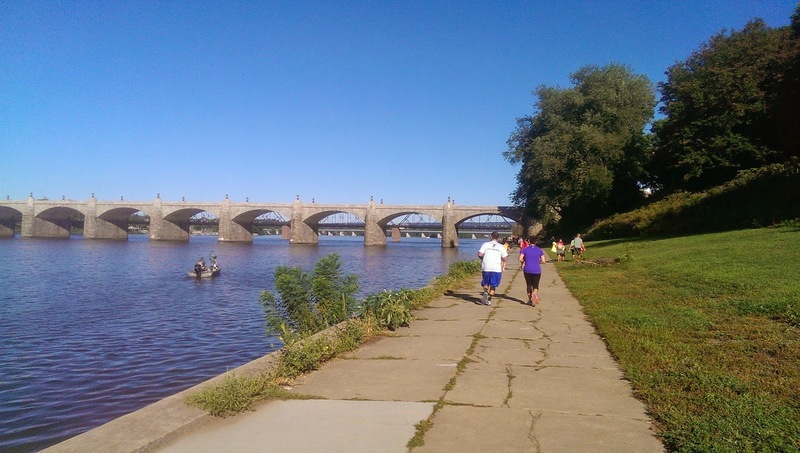 Congratulations on the Harrisburg Half and nice recap. You captured some pretty views of the city. I for one like running over bridges. There's just something about running over a bridge that is scary and exhilarating and usually beautiful! 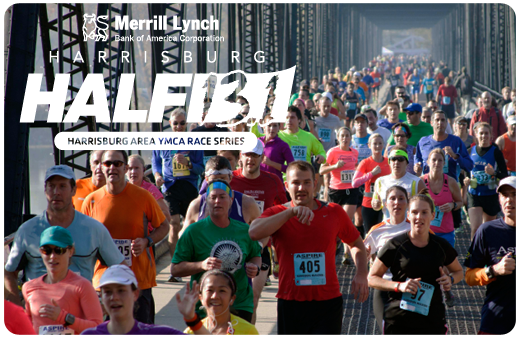 Looks like Harrisburg is a great race. The course looks beautiful! Way to overcome the mental difficulties you were having at the end of the race! 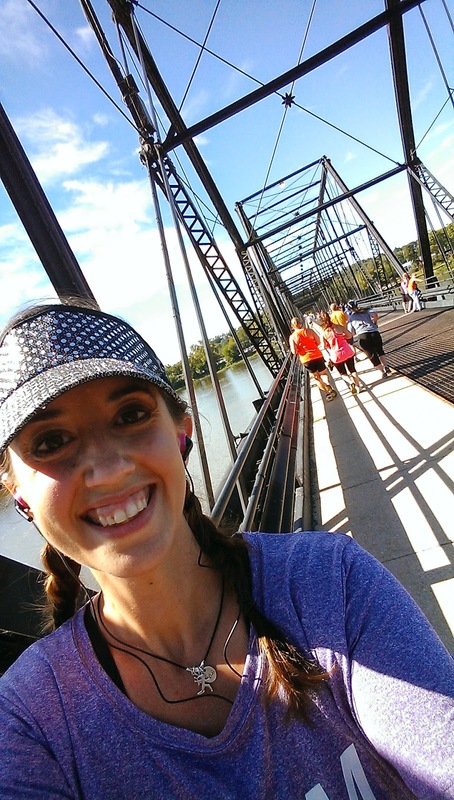 I've never gotten to run over a bridge during a race, but I think I would enjoy it. I'm hoping to get into the Run Across the Bay 10K next year that runs over the Chesapeake Bay Bridge in MD! Oh that one will be awesome for sure! We may do it in 2015- it's the same weekend as Wine and Dine so we can't do it this year. 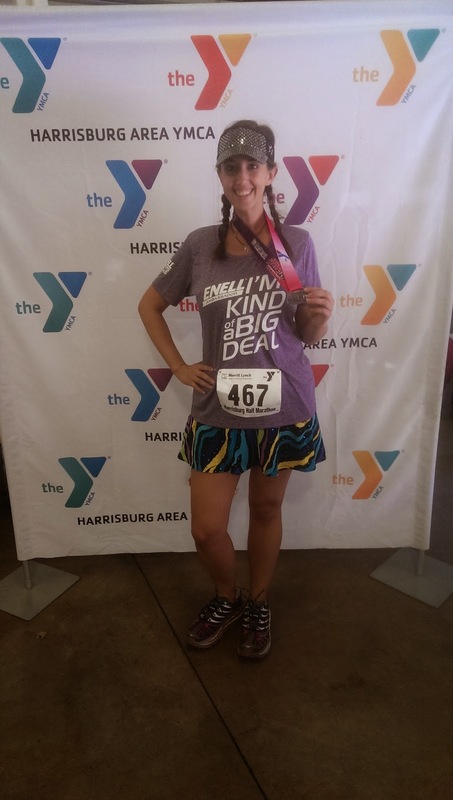 I also ran the Harrisburg Half. I really enjoyed most of the race. I'm also glad that it brought me to your blog. I wish the medal was more akin to the 2013 medal. The shirt's sheerness was a slight bother. I too will definitely be running this race again in the future. Best of luck with your injury! Thank you! And yes, the medals and shirts left a lot to be desired- especially after what previous years had been. Hope to meet you out on the road soon! Good for you guys. That's so great that the weather was good throughout the whole race. It seems just like it was perfect for running. Not too hot, not too wet. The route took you past some beautiful spots as well. Lovely way to spend some time. I was looking for reviews of this race and found yours! You wrote a great review and because of it, I now want to do this race. I hope the weather is just as nice when I run it. 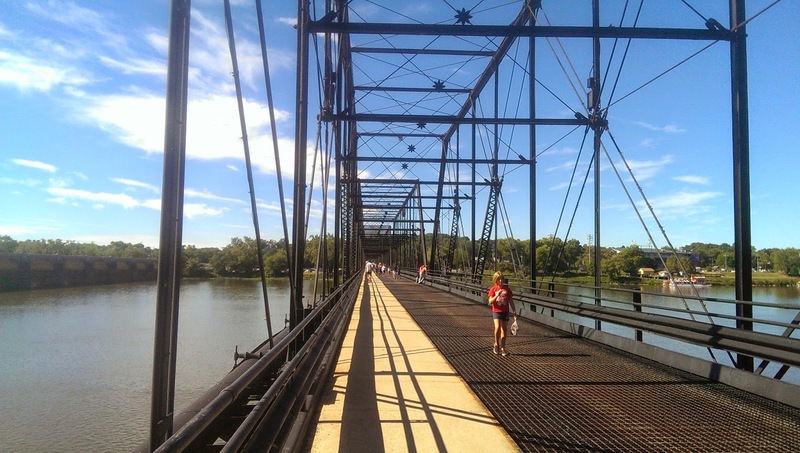 I haven't run any races with bridges but I do have a bridge on my training route that I enjoy running on! It really was a fun, no-frills race! Matthew and I are running it again this year- will I see you there? !